Beast Coast! Is the title of the movement of the east coast MC’s who are attempting to bring that 80’s and 90’s New York sound back to the hip-hop/rap game. A newer rap duo emerged not too long ago from the Brooklyn area. The Underachievers (UA) are linked up with Pro Era, A$AP Mob and Flatbush Zombies as the heads of the movement. Their last mixtape, “Indigoism” was a very solid piece of work with a lot of hot tracks. The UA have their own style that they bring to the Beast Coast movement so nothing gets repetitive within these three groups. UA sound is very dark and ominous with gritty lyrics to lay over their beats. 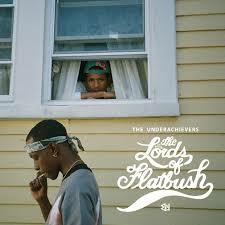 The Lords of Flatbush is an 8 track mixtape with up tempo tracks and fast flows to match. As far as lyrics go, there aren't much profound, spiritual, triple entendres like Joey Bada$$ and that Pro Era crew, just punch lines and pound for pound bars. Dash and AK are simply concerned with bodying beats in the simplest way. By far the best songs on here are “Cold Crush” and “Melody of the free.” There isn't much to listen to and the tracks are short but it is still something to hold UA fans off for a while.